Supernatural opened it's eighth season on a new night, up against the most watched Presidential debate since 1992, and still pulled in 1.82 million viewers with .8 million in the all-important 18 to 49 ratings. These ratings are similar to that of season seven averages of 2.03 million with .89 million in 18 to 49 ratings. 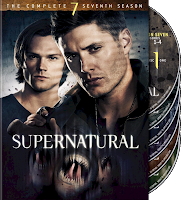 Supernatural Season Seven was recently released on Blu-Ray, DVD. Season Seven is also now on Netflix Instant Watch.